I’ve always loved strong flavours: aniseed balls and liquorice featured heavily in my childhood sweet habits. 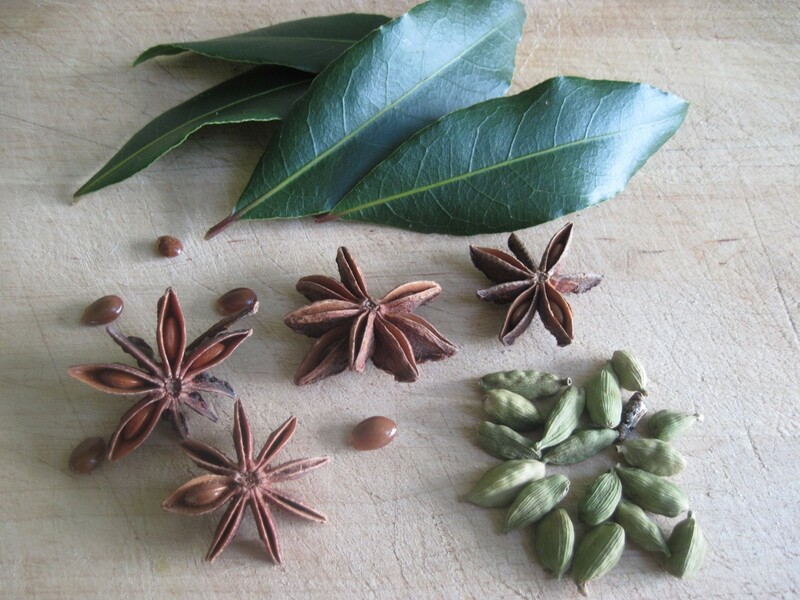 Now I’ve grown out of sweets, I get my fix from star anise and fennel. And what better way to combine the two than with a beautiful, slow-roasted piece of pork belly? On first sight, pork belly looks extraordinarily fatty (and it is), but when it’s been cooked properly, it takes on mouth-wateringly melting properties. Yes, the fat is still there, but it’s turned into the most delicious crispy crackling, and the meat underneath is beautifully succulent. I have to confess to not showing AlphaMale the uncooked pork, for fear of his reaction at the amount of fat on it, but it was declared a complete and utter triumph by the time it reached the table. And the best bit? It’s only £5.89 a kilo (Morrison’s price last Thursday), so it’s fabulously economical. Sold? Then read on. The starter and main course recipes have both been adapted from Gordon Ramsey’s Ultimate Cookery Course. This is a really simple but totally delicious starter, which takes minutes to prepare. Mix the apple and watercress with half the lemon juice and zest, and season. Drizzle with olive oil and mix well. Place onto serving plates. 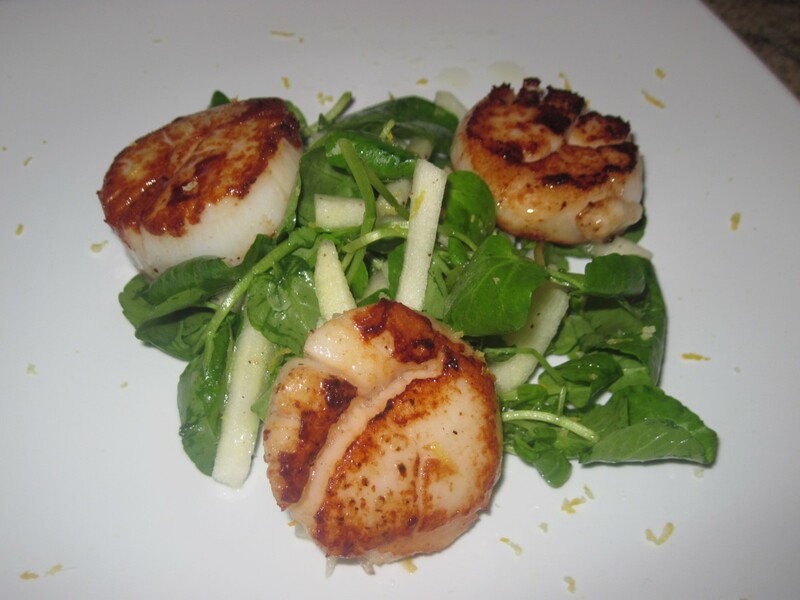 Heat a tablespoon of olive oil in a large frying pan until smoking hot, then add the seasoned scallops one at a time in a clockwise direction. Cook for 2 minutes. Turn the scallops, starting with the first one placed in the pan, and cook for a further 2 minutes. Squeeze over the remaining lemon juice and shake the pan, then turn out onto a cold plate lined with kitchen paper to stop the cooking process. Place on top of the prepared salad and sprinkle over the remaining lemon zest. 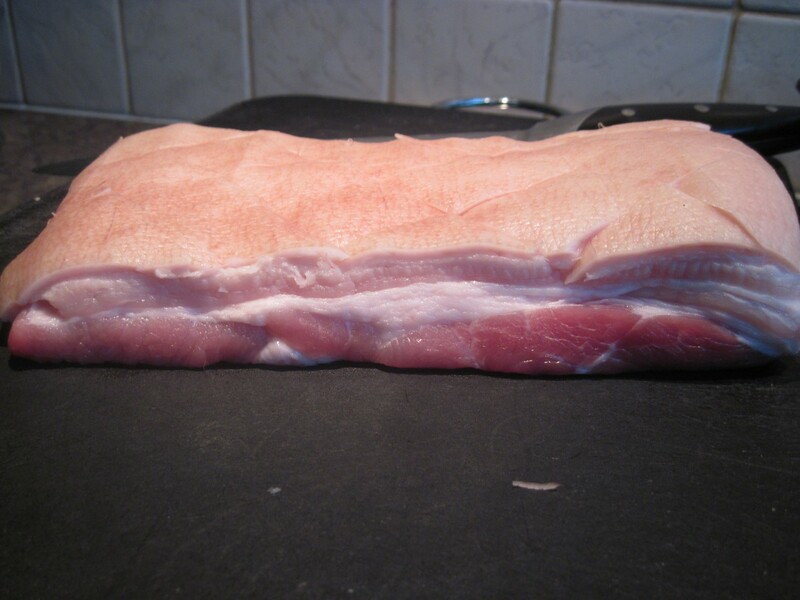 Diagonally score the pork belly skin and season well with salt and pepper, rubbing the salt deep into the cuts. Heat a splash of olive oil in a deep roasting tray just large enough to hold the meat with an inch or so space around the edge, and add the sliced fennel, bay leaves, star anise, garlic, cardamom and half the fennel seeds. Heat for about 2 minutes until fragrant, then push to the sides of the tray and add the pork, skin side down. Press firmly down on the pork, and cook for around 5 minutes until the skin is starting to turn golden brown. 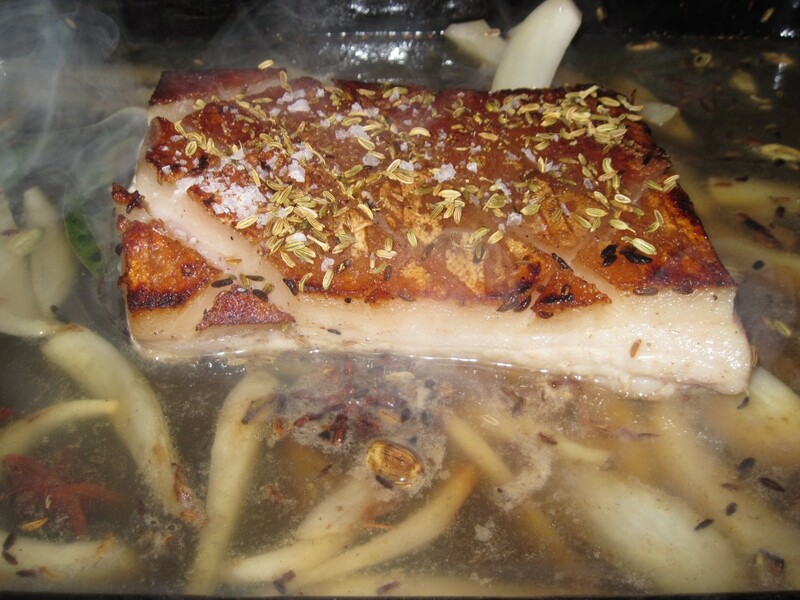 Carefully turn the pork over, season again and sprinkle with the remaining fennel seeds. Pour in the wine and scrape the bottom of the pan to deglaze it, taking care not to get the pork skin wet. Bring to the boil, then add enough stock to come up to the layer of fat just below the skin. Transfer to the oven and roast for 2 hours,but start checking it after 1 1/2 hours to make sure that the cooking liquid isn’t boiling dry. Gordon failed to mention this bit, and mine was just about dry, which made the gravy too dark, hence the inclusion of a tiny photo of the meal – it spoiled the appearance of it. However, it didn’t affect the flavour of the meat at all, which was a relief. 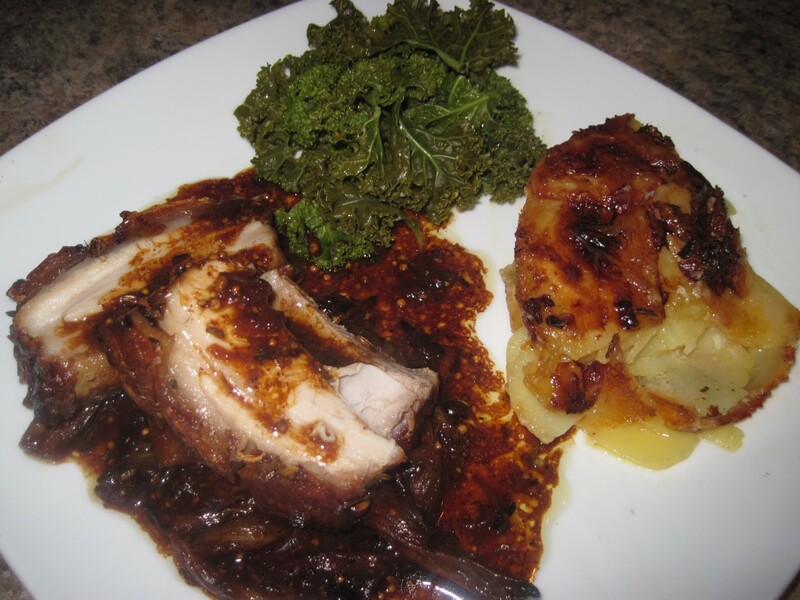 I served the pork with Dauphinoise potatoes and steamed kale. These are fairly straightforward to make (please don’t be put of by the long list of ingredients), and can be made a day in advance. I do freeze mine, but I find that the base doesn’t stay quite as crisp as when first made. This recipe makes four mini cheesecakes, using greased chef’s rings as moulds, and one medium sized cheesecake, using a small spring-formed cake tin. Defrosted Fruits of the Forest, or Summer Fruits to serve. Grease the spring-form tin and line the base; grease the chef’s rings and place on a lined baking tray or dish. Mix the melted butter, the biscuits and the almond essence together and divide between the tins. Press down firmly and chill until ready to add the filling. Soften the gelatine sheets in cold water for 2-3 minutes; drain, then add a tablespoon of boiling water and stir until dissolved. Mix well. Beat the mascarpone, soft cheese, vanilla and sugar with an electric mixer until smooth, then add the lemon juice and gelatine and mix again. Softly whip the cream and fold into the mixture, then divide between the tins, smooth, and refrigerate overnight. At this stage, the cheesecakes can be frozen. To remove from the tin, simply release the spring, and transfer to a serving plate. To remove from the chef’s rings, place the ring centrally over a jam jar and slowly force the ring downwards, so that the cheesecake ends up balanced on the top of the jar. Then slide carefully onto a plate. Or, if the cheesecake is frozen, it can be forced gently downwards out of the ring onto a plate. Gently heat the berries in a saucepan with an equal amount of sugar and cook until slightly jammy. 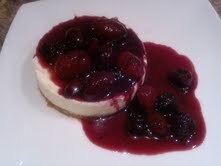 Place a spoonful on the top of the cheesecake, so that the juice dribbles down the side and onto the plate.